From camels to milkshakes, and spices to steak dinners, everything is up for grabs in the Negotiation Phase of Hafid’s Grand Bazaar. In Hafid’s Grand Bazaar players bid, bargain, and trade goods to create valuable sets they can sell to customers for points. We recently ran events at Gen Con and witnessed some seriously fantastic bargaining skills. We had such fun watching everyone who sat at the table get in the spirit of the game with clever trades and good-natured haggling. What follows is a case study of one play through that led to an epic trade that became legend during the show. It started innocently enough with a group of five players, four who knew each other and a fifth stranger (spoiler: he didn’t stay a stranger for long!). The cast of this story is Corey (nephew), Jacqueline (niece), Steve (uncle), Ruth (aunt), and Daniel (stranger, for now). This game was played in 5 rounds, with each player getting a chance to start the Bidding Phase during the game. The first round was pretty tame as the players familiarized themselves with the rules and flow of the four phases of each round (Bidding, Caravan, Negotiation, and Selling). In round two, the imaginative trading started and it was the first time real money had entered a game for us. Corey really wanted a card representing Linen in the Textiles category and put up a Finished Goods card, a commemorative Gen Con 50 die, AND all the change in his pocket for it. Daniel agreed to terms and they made the trade. We were surprised to have this type of trade escalate so early in the game, but we did have previous games where a milkshake was traded for a goat and a player asked a stranger at another table for an onion ring to complete his trade, so we knew it could get creative. Table talk is highly recommended in Hafid’s Grand Bazaar and Daniel (our non-related player) fell into an easy camaraderie with the other players. There was a lot of laughter and joking as the players discovered a shared love of the show Parks & Recreation and there were a lot of quotes thrown around, particularly quotes from Ron Swanson. Daniel told the group about St. Elmo’s Steakhouse (just across the street from the convention center we were in), how good their steaks are, and that they filmed some scenes for the show there. In the fourth round, Corey found himself without access to a customer to sell his wares to and had to negotiate with Ruth for access to her customer to score points. She exacted a price for that service and walked away from the trade with all the remaining cards from Corey’s hand, setting herself up for some serious scoring as they entered the final round. The conversation kept returning to food and those St. Elmo’s Steakhouse steaks were on everyone’s mind. The final round progressed with everyone furiously trying to make the best deals they could to score big one last time in the Selling Phase. Steve had been a pretty even keel player throughout the game, not buying into any of the crazy deals the other players were offering, and remaining a shrewd bargainer making sure he got the best end of each deal he made. The table got quiet for a moment while Steve mulled it over. Jacqueline tried to talk him out of the deal. Ruth stated she should get something from Corey as well since it was their money that would be spent on the steak. It turns out Steve REALLY wanted to win so he could hold that over Corey for years to come, and despite the protests and counter offers Ruth, Daniel, and Jacqueline tried to make Steve ultimately agreed to the deal. Steve ended the game with 442 gold talents/ victory points when he added the 208 he got from Corey to the 234 he had amassed on his own. He wouldn’t have won without Corey’s points. He was 4 points shy of Jacqueline’s score without them. The rules of the Negotiation Phase are 1) You can’t lie, 2) You can’t steal, and 3) You must honor the deal. This group came by our booth on Saturday with photo proof that Corey DID get his milkshake and steak dinner and that he was satisfied with the deal. And in true Hafid style, Steve negotiated with our show staff to get to take one of our demo copies of Hafid’s Grand Bazaar home with him after the show. That is what we call dedication to a theme! We are so honored to got to witness these gaming memories when they are made and we now have 5 new friends for life. We ran into our new friends several times during the course of Gen Con and hung out with Daniel (the former stranger, now inner circle member) for a few hours after the event talking about games, escape rooms, hotel horror stories, and all matters geeky and wonderful. THIS is the power of coming to the table with an appetite for fun! Want to have your own game night of making epic deals and manipulating the market? 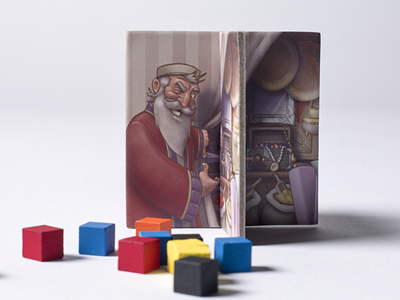 Get your own copy of Hafid’s Grand Bazaar at your Friendly Local Game Store September 20! It has been a full week since we got home from Gen Con 50 in Indianapolis and we are still riding the high of such a successful show! Thank you to everyone who came by our booth to say hi, check out our games, and give many of them good homes. Element continues to be a solid hit for us and all three demos setups were slammed the whole weekend! A lot of new players out there now, it should be easy to find a group to play with. Check out this demo video from Team Covenant from the show. This Belongs in a Museum was the favored co-purchase with Element. People really enjoy this “simple” tile-laying game loaded with layers of strategy. Our fans are so dashing! Check out these dapper fellows! This adventurous gamer found the right booth and the perfect game to match his attire. So dashing! This fan surprised Mike & Grant by showing off his Rather Dashing logo tattoo!! 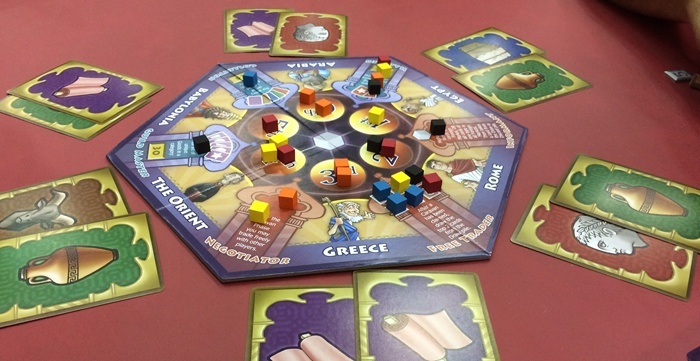 This raucous trading game of shrewd negotiation releases September 20! We’ve received our production sample of Hafid’s Grand Bazaar and some advance copies for reviewers! We recently shared the Rulebook on the official game page and are working on a How to Play video. That means it is time to get your pre-orders in with your Friendly Local Game Store (FLGS)! 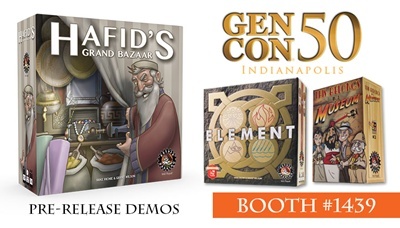 To get you up to speed before the game releases September 20, we will be running demos of Hafid’s Grand Bazaar in booth 1439 at Gen Con and we have a few slots left in our full play-through events scheduled in the evenings after the exhibit hall closes. Take advantage of these opportunities to learn from our design team, Michael Richie and Grant Wilson! At least one of them will be on hand for every event. SPECIAL BONUS: If you pre-order with your local game store you can get the exclusive promo card pack of Magic Lamp Merchant Cards. These packs include a wild card for each Category of Goods in the game (Textiles, Livestock, Raw Materials, Food, Finished Goods). You can use them to represent any specific good in that category to complete a set of goods for maximum profit! Brush off your bargaining skills and get ready to wheel and deal to become the greatest merchant in the land in Hafid’s Grand Bazaar! Pre-Order Today! Getting Ready for Gen Con 50! In ONE WEEK we will be in Indianapolis for “The Best Four Days in Gaming” and the 50th anniversary of Gen Con! 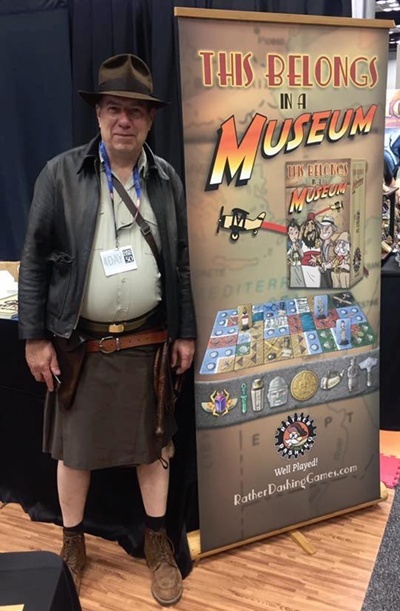 Visit us at Booth #1439 in the Exhibit Hall for demos of Element, This Belongs in a Museum, and Hafid’s Grand Bazaar, as well as fun swag and more great games to add to your game collection! Looking for a bit more than a quick demo of Hafid’s Grand Bazaar? There are still a few slots open in our full play-through events! This is a unique chance to get to play a game before it is released and our team is excited to introduce you to this lively game of bidding and negotiation. You can sign up for a slot in the following events by visiting the Gen Con Event Finder page. When you purchase two (2) or more games in a single transaction you will automatically get $10 off your total! Stop by to see the other specials we’ll have throughout the show. We will have Element and This Belongs in a Museum available for purchase as well as We Come in Peace, Dwarven Miner, and others! You will also want to grab one of our 2017 collectible “I Am Rather Dashing” buttons while supplies last! Got little ones? We are providing activity pages featuring our characters from This Belongs in a Museum to the kids area. We’d love to see your child’s artistic skills, so swing by booth 1439 with their completed art to show us! RETAILERS: We will have copies of the Quick Start Demo Guides for Element and This Belongs in a Museum for your stores. You can stop by and ask any booth staff member for a couple for your stores and sign up for our mailing list and store locator map! We thought you would like to know what you are getting with our next release! Check out our unboxing video of Hafid’s Grand Bazaar and learn a little more about the components and how they propel the gameplay in this lively trading game coming your way September 20. 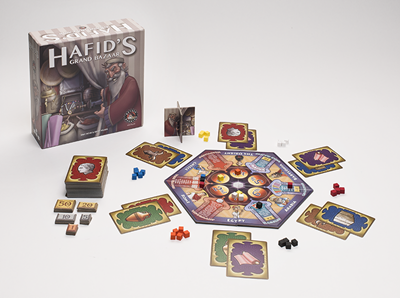 Hafid Marker – this 3-D representation of Hafid, the market’s grand master, is passed around throughout the game to indicate the leading player for that round. The game is played in a series of rounds equal to the number of players (for a 2-player game you play four rounds). Each player gets a turn to go first in a round and this marker helps you keep track of which player is leading the bidding that round. Bidding Cubes – Each player will get 6 bidding cubes to use each round to bid on the various Caravans, Customers, and Influence. Once a cube is bid in a round it is forfeit for that round, even if you get outbid by another player, but you do get them all back at the end of the round for use in the next round. Use them wisely to maximize your access to lucrative goods and information! Merchant Cards – The all important commodities of a bustling market. These cards represent the items for sale in the market that you will be jockeying to collect and trade to create the most desirable sets for your potential customers. The back of the cards display which Category of goods your items belong to, while the front the card shows the specific good that card represents and where it falls in the hierarchy of scarcity for that category. The categories are Textiles, Food, Livestock, Raw Materials, and Finished Goods. These cards are your lifeblood as a merchant and will be your most valued resource in the game.